We tend to think of the smaller end when we think of container planting when actually there are so many benefits to larger scale planting in pots/troughs etc. Lovely though they are, smaller pots freeze, become waterlogged and dry out more easily, creating a bit of a rod for your back. Also, if you are not careful, you end up with a great mass of grouped small planted pots, when actually just one, two, or perhaps a collection of three larger ones would make a much more dynamic display. I have always loved planting large containers as if they were small flowerbeds, with a structure of small shrubs and perennials, underplanted with bulbs. They can then be finished off with annuals to add colour as necessary. Be careful not to overplant as you might in a hanging basket or something, It is important to allow space for the plants to thrive, to gain their natural shape, just as you would in a mixed border of plants. I love stone troughs (as I think is evident from the stock I buy). 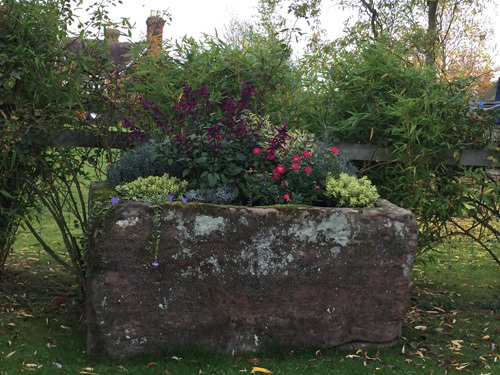 Stone keeps the soil cool and moist for longer during the summer months and the scale of planting in troughs allows it to keep unfrozen for longer too. Large scale copper pots are wonderful planted. Why not try Hostas to also be free of slugs and snails who love Hostas but hate copper. 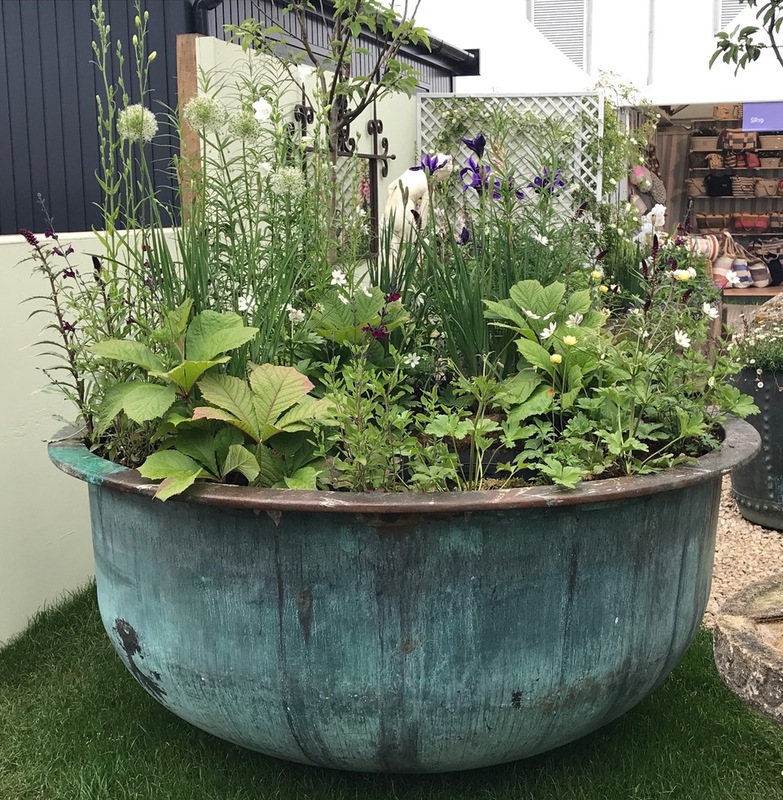 If you then place that copper pot in the flowerbed you will have the added advantage of giving all year round colour with the green hues of the verdigris. 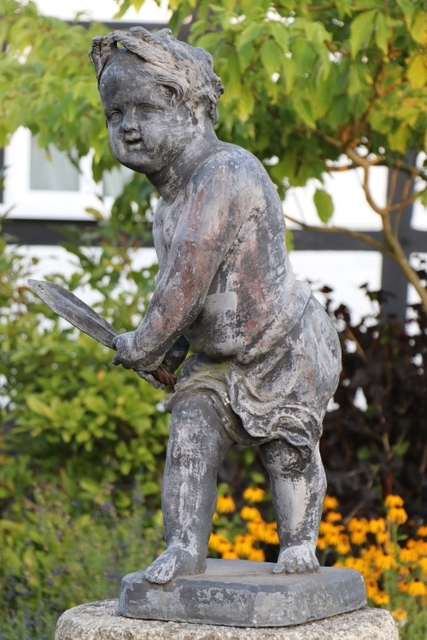 Terracotta is a great material for large planters – old terracotta or stoneware if at all possible for robustness and longevity. We have several extra large terracotta washpots at the moment – they are 19th century, stoneware terracotta washpots from France. Strong, hardwearing material and fabulous planted up with perhaps a flowering shrub or multiples of lavender, daphne, roses or herbs. Lead is the other material so in keeping with our plants and planting in this country. 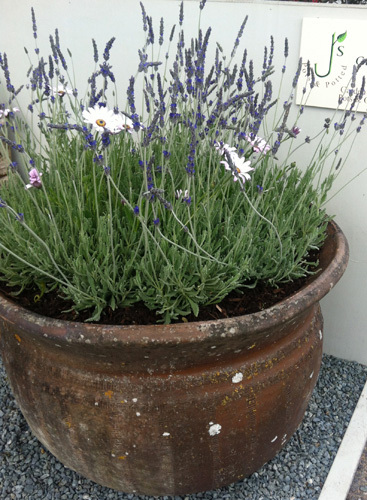 The softer, lighter grey colours of the old lead lend themselves beautifully to a large scale mixed planted container. Add spreading plants for the edges to grow over and down the sides like a huge flower arrangement. To plant successfully in containers, it is important that they are free draining. Waterlogged containers drown and freeze roots of plants. 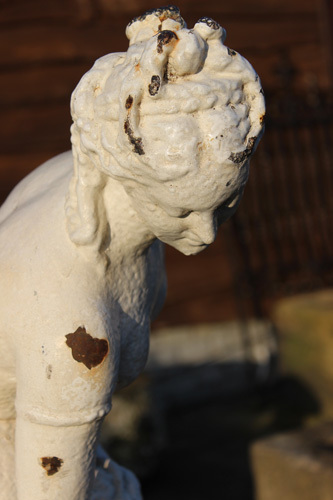 Stone troughs often have drainage holes on the sides. When drainage holes are through the bottom of a pot, it is important to allow some space below so that it does not get blocked and the water can drain away. - Put a good depth of stones or crocks in the base of it. If the drainage hole is large, place something across part of it to stop the stones getting washed away. - I would always use a loam based compost as it retains the moisture longer and it adds weight to the container. 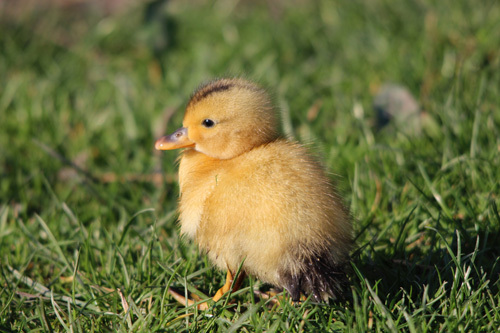 If you feel you might want to move the container around the garden to different sites you might like to put it up on bearers so that a sack barrow (for smaller ones) or a pallet truck or wheeled trolley can be put underneath for ease of movement. A simple way to move any larger, heavier containers is to use round poles or rollers. Supermarkets sell cheap and simple wooden rolling pins which work well and we use for all sorts of things. The other thing to remember is that when you move house, you take your containers with you. On display in the Victoria & Albert Museum in London, this beautiful statue has been the subject of so many reproductions over the years. Fountains and sundials and statues. It is a stunning subject. 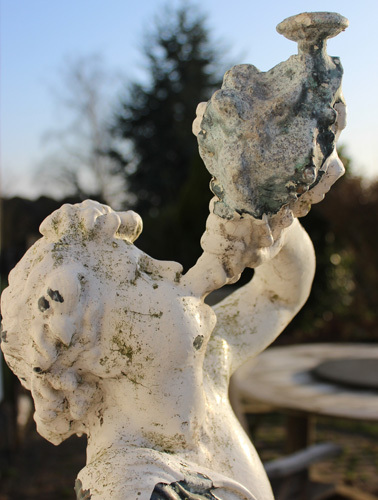 This one was originally commissioned in 1914 by the 6th Duke of Bedford for his country residence – Woburn Abbey. He had fallen for the first sculpture which Antonio Canova had made for the Empress Josephine (estranged wife of Napoleon Bonaparte) having seen it when he visited Canova’s studio in Rome. He offered to buy this as Josephine had recently died. Her son had the sculpture in the end and it is now displayed in The Hermitage, St. Petersburg. A second study was commissioned and was installed at Woburn Abbey in 1819, supervised by Canova himself. 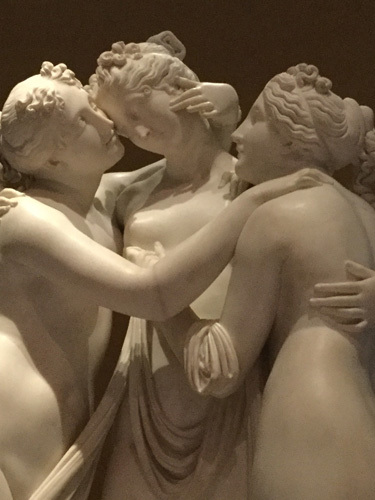 The three graces were daughters of Jupiter or Zeus – Thalia (youth and beauty), Euphrosyne (mirth) and Aglaia (elegance). 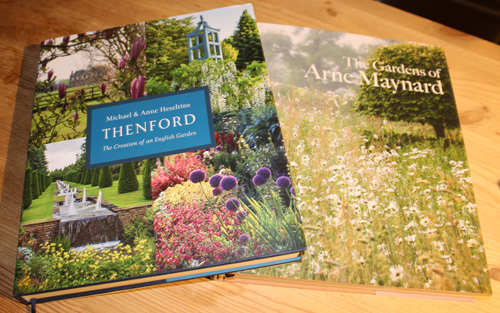 Two fantastic books on English gardens at their very best. 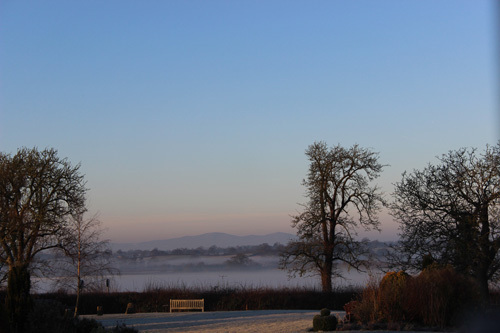 One just published, 'Thenford', about Thenford House and garden near Banbury. 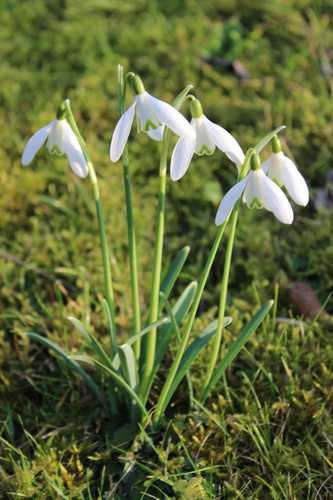 The finding of, the inspiration for and the creation of the garden of Lord and Lady Heseltine, written by them. 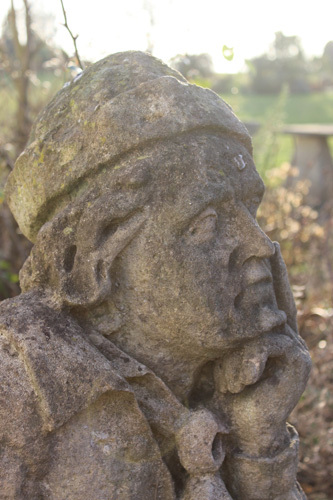 This is the full story of the garden at Thenford – captured in photographs and memories from its very beginning to the inspiration it is today. The book covers its creation and evolution over a 45 year period. It is absolutely beautiful and a must have in my opinion. Anyone who has read these newsletters previously will have heard my love of this very English garden, I cannot recommend it enough. The other is 'The Gardens of Arne Maynard’, detailing gardens designed by him in this country and on the continent. 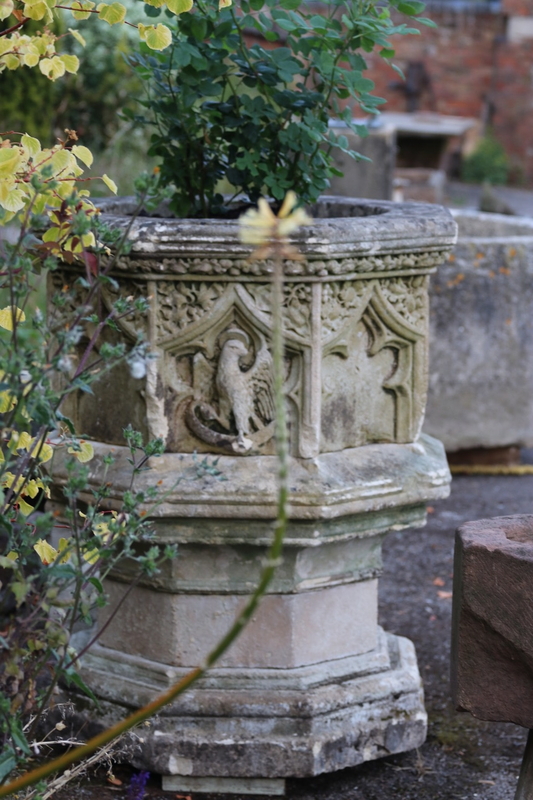 It is a fascinating place to visit for several reasons – from an architectural point of view, to see the still used Baroque chapel with its most amazing decoration and carvings and to view the truly splendid Portland Stone fountain which has been restored to operational use. 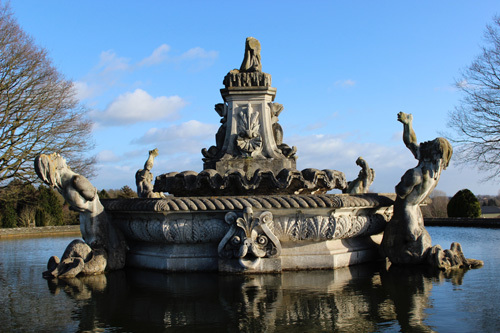 The fountain shows the Greek hero Perseus, rescuing Andromeda from Poseidon’s sea monster. It is surrounded by dolphins, shells and armed Nereids. 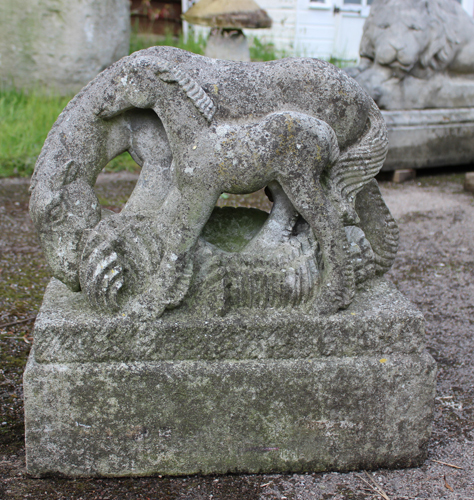 It is a truly huge piece of Portland stone sculpture. The basin is 55m x 37m and the central part of it rises above the water by 8m. 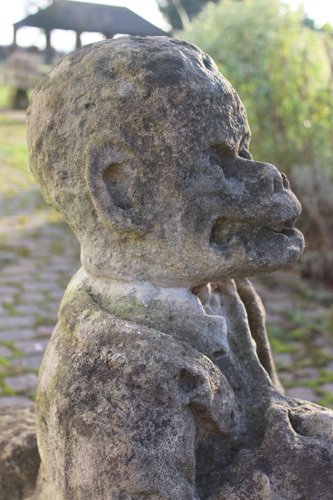 It was carved by James Forsyth who also crafted many of the wooden sculptures in the chapel. Originally the dolphins were fitted with reeds on their water nozzles so that, as the water was pumped through, they played notes. The tunes could be varied and the sheet music for them still exists. Unfortunately the renovation work did not extend to the reeds, so they remain silent today. It took 4500 gallons of water each minute to run the fountain's 400 water jets. This was originally pumped uphill using a horse powered steam pump to reservoirs half a mile away. Due to the height of the reservoir, gravity was then used to provide enough pressure to power the jets. Unsurprisingly the fountain was only in full operation a couple of times a week, when the owners were in residence. They can still be seen running periodically nowadays so it is worth finding out when they will be working to see them in their full beauty. 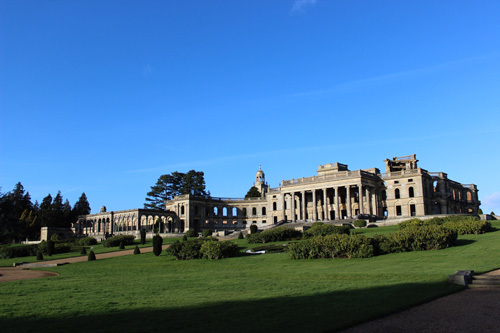 My mother grew up in a house on the hill opposite Witley Court and was just 5 years old when she remembers watching the fire with her nanny and going to the smouldering ruins the next morning to see the remains. A very sad day. My grandfather, Dr Bernard Goodwin, ended up owning Pool House and the lake across from Witley Court. I was lucky enough, as a child, to have the opportunity to play in amongst the rhododendrons and on the lake before Pool House and the grounds were rightly bought back for Witley Court. This is a really beautiful place, steeped in history. 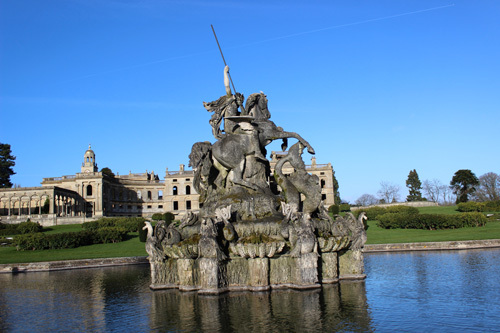 Thanks to English Heritage, hundreds of visiting families are now able to enjoy the grounds and lake each year. Well worth a visit and I highly recommend taking the children.